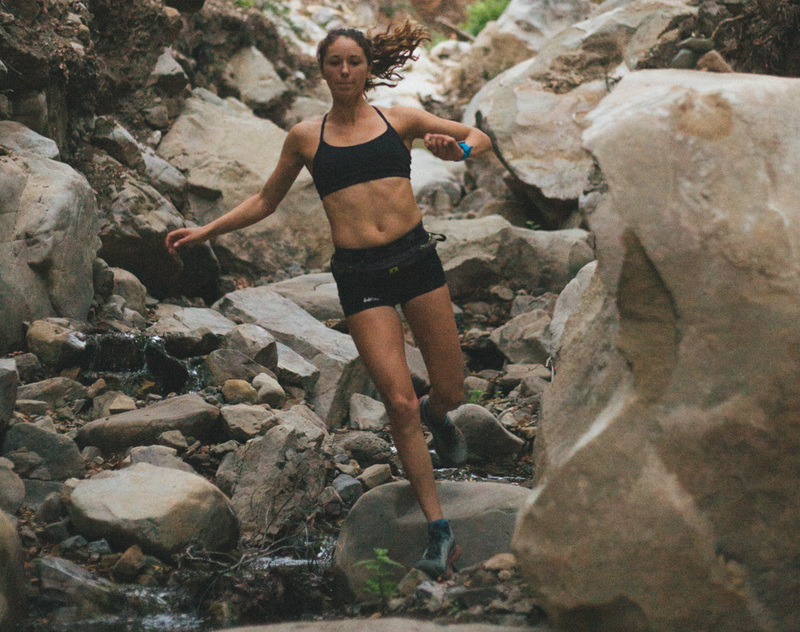 Dani Moreno’s skill in negotiating steep descents is a hallmark of her trail-running success. Dani Moreno’s coach gave her a week off after she defended her women’s title on December 2 at the XTERRA Trail Run World Championship, a punishing 21-kilometer race on hilly terrain in Hawai‘i. It was her fifth victory of 2018 on the trail-running circuit. “Have fun,” Terry Howell said. The next time they talked, Moreno excitedly told him, “I just got back from skydiving.” She was not content to take one jump out of a plane near Lompoc. She jumped four times. Her other activities include rock climbing, snowboarding, kayaking, lobster diving, and spearfishing. Those, along with her job as a program manager at Procore in Carpinteria, enable her to achieve some balance in life. But if there’s an occasion when she totally channels all her mental and physical resources, it’s when she races on a trail. It may have been infused in her before birth. “My mom ran when she was pregnant with me,” she said. Both her parents were LAPD officers. Dani, the middle of five children, grew up in Downey and was an accomplished athlete at Warren High School. That led her to run cross-country and track at UCSB. She is the fourth-fastest female 10,000-meter runner in Gaucho history, clocking 34:23 in 2015. But years of training and competing, all the while being a diligent student, left her burnt out. “After college, I thought I was never going to compete again,” she said. “I didn’t run for several months.” She stayed in Santa Barbara and found work as an outdoor guide. When she resumed running, it was different from before, inspired by a sense of freedom. “I would blow off steam by running 10 minutes up and down the San Ysidro Trail,” she said. In March 2016, Moreno entered the Marin Ultra Challenge, a 25-kilometer race in Sausalito, and set a new course record. A cash prize came with it. She was now a serious professional athlete. She has acquired several sponsors, including hometown shoe and apparel companies Hoka One One and rabbit. Ramiro “Curly” Guillen, another former UCSB runner, connected her with Howell, a Santa Barbara–based nutritional consultant who provides individual training programs for a dozen men and women he calls the “Blue-Collar Runners” because they all have full-time jobs. Running is not a simple thing to Howell. He sees science and technique in the sport. In Moreno’s case, he points out her skill and concentration in racing downhill. Moreno’s accomplishments in 2017 ended with her triumphant debut in the XTERRA World Championships, a trail-running fixture since 2008. The scenic course, the setting for many Hollywood movies, is on Kualoa Ranch in Oahu. This year Moreno, 26, ventured into skyrunning, a high-altitude sport popular in Europe. “It’s very technical running on hard courses,” she said. In November, she won the women’s U.S. Skyrunning Championship at El Paso, Texas. Then it was on to Hawai‘i, where two-time champion Polina Carlson was geared up for the XTERRA race, and elite marathoner Taylor Ward also was entered. “I took my time going out,” Moreno said. “I made a move at mile five. My legs felt strong. I was confident. A mile and a half from the finish, there was an army tower where war movies were filmed. Somebody up there shouted, ‘Go, Polina.’ I realized how close she was and pushed harder.” Moreno finished a minute and a half ahead of Carlson for the women’s crown and was ninth overall out of 556 runners. In the coming year, Moreno has set her sights on her first ultra-distance race, the FOURmidable 50K on February 16 in the mountains around Auburn, California. “All the best women will be there,” she said. “I’m excited to see where I stack up.” The course has four major climbs — which also means four descents where Santa Barbara’s downhill demon will be picking up the pace. On the same day Moreno was tearing up the course in Hawai‘i, five runners coached by Howell came up with excellent results in the California International Marathon at Sacramento, a race that also served as the U.S. Marathon Championship. Two of them — Jarrett LeBlanc of Louisiana and Ryan Miller of Texas — ran Olympic Trials A Standard qualifying times, finishing respectively in 10th place (2:13:52) and 12th (2:14:27). Curly Guillen, who lives in Goleta, finished 51st in 2:18:50, the second time he has hit the Olympic Trials B Standard. Santa Barbara’s Jill Deering, seven months after giving birth to her first child, set a marathon personal record of 2:48:32, as did SBCC professor Jenn Betancourt (2:52:21). “With Dani winning in Hawai‘i, it was a dream day for any coach,” Howell said.